Tirumala Darshan Timings and Types of Darshan available in Tirumala. Divya Darshan is the free Tirumala darshan where in the pilgrims wait for their turn to catch the glimpse of Lord in the compartments of Vaikuntham Queue Complex II. Divya Darshan means ‘darshan for all’. Pilgrims who come by walk via Alipiri and Srivari Mettu footpath routes to Tirumala comes under this category. 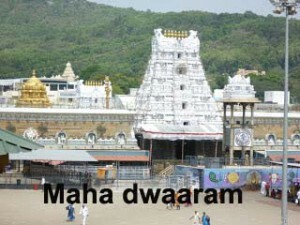 The timings for Divya Darshan (Tirumala Darshan) are different on different days of the week. On normal days, about 3-4 hours are allotted for Divya Darshan and on peak days it goes to 10 hours. Special Entry Darshan is to arrange quick Tirumala Darshan to the Pilgrims when the crowd rush is heavy. Cost of the Ticket is Rs.300/- per person and is issued at VQC-I. There is a special entry point thru Supadam for NRIs , in-service military personnel, less than a week old newly married couple, parents with infants below one year of age, for the family of employees. Differently abled and the Senior Citizen devotees, men should be 65 years and above, women should be 60 years and above to access Special Darshan line. Special entry Darshan line is near Tirumala Nambi Temple in South mada street, which is beside main Temple. The pilgrims falling under this category will be allowed in two different slots at 10am and 3pm every day on showing the age proof id-cards/ relevant medical certificates. 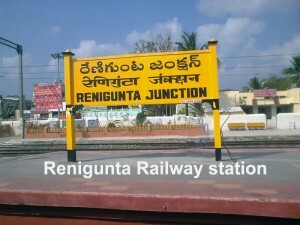 Couple who ties the knot in the abode of Lord Venkateswara in Purohit Sangam comes under this category. The total expenditure for a marriage is Rs.865 out of which Rs.500 is Dakshina to Purohit, Rs.300 to melam and Rs.65 towards marriage video. Purohit sangam is at Papavinasanam Road. Pilgrims who plan to do Angapradakshinam should stand in Queue at C.R.O office counter. Tickets will be issued for next day , It is free and ticket is issued using biometric finger print. 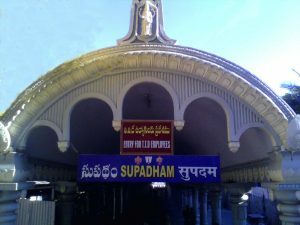 At 1:30 am, the next day devotee should report at Supadam Entrance after having bath. It is good to take bath in Swamy Pushkarini and Do Darshan at Aadi Varaha Swamy Temple before Entering Angapradakshina. Pilgrims should have taken bath and there should be wetness in the clothes. By 2:30am you will be inside the temple. You have to lie flat on ground & perform the Angapradakshinam in the inner prakaram. Immediately after this Pilgrims will be allowed for Tirumala Darshan. This is very good because Suprabhatham pooja also will be going on at same time. In and Out time from the Temple is just 2 hrs. 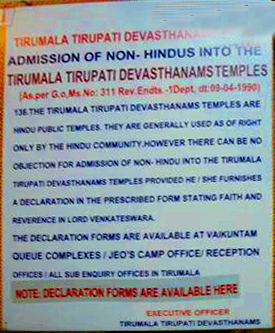 Admission of Non Hindus into T.T.D maintaining Temples: Tirumala Tirupati Devasthanams Temples are Hindu Public Temples. They are generally Used as of Right only by the Hindu Community, However there can be no objection for admission of Non-Hindu into the Tirumala Tirupati Devasthanams Temples provided He/She furnishes a declaration in the prescribed form stating faith and reverence in Lord Venkateswara. The declarations forms are available at Vaikuntam Queue Complexes/JEO’s camp Office/ Reception Offices/All Sub Inquiry Offices in Tirumala. Tirumala Darshan Ticket is not required children below 12 years of Age. One must carry Age proof of the Child. Special Entry for Tirumala Darshan is available for Infants and His/Her parents below 1 year age thru Supadam. T.T.D has introduced e-Darshan facility, where in the pilgrim is provided with Tirumala Darshan slot before actually the pilgrim reach Tirumala. e-darshan counters were established in most of the T.T.D Kalyanamandapams and Information Centres in all most all parts of Andhra Pradesh and outside Andhra Pradesh. 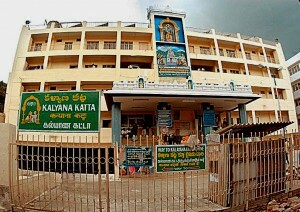 Pilgrims are allowed inside Vaikuntam Queue Complex-I, as per the time slot. 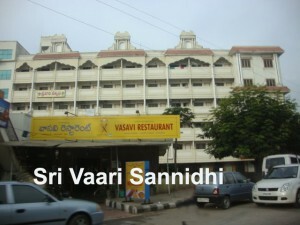 Sri Vaari Sannidhi, which is on the way to Kapila Theertham from R.T.C Bus station( 1 km from Bus station). If Devotee fails to get Rs.300 tickets online, there is one more way for Tirumala Darshan, Tirumala Darshan tickets are issued Tirupati Head Post Office. I would like to visit the shrine of BALAJI on 25/26th of Jan2019 but the online Rs.300/- ticket is not available.Can I get it directly. If so when(time)&where it is available. Expecting your valuable reply. DEAR SIR, I AM PLANNING TO COME ON 4TH OF JAN 2019, SO PLEASE SUGGEST ME HOW I CAN GET ACCOMIDATION. Sir if we come to tirumala on 19 Dec 2018 by walk how much time take for dharshanam. 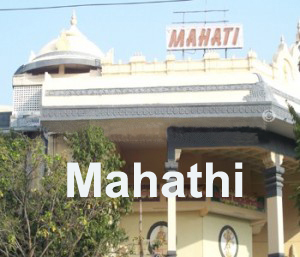 It takes 12+ hours for darshan , if you need special darshan please contact 9393939150. It will be available at alipiri and srivarimettu daily.